When an American railway reached the upper Mississippi River in the late 1850s, the Fort’s place in Hudson’s Bay Company plans became even more important. The route through St. Paul, Minnesota to the eastern seaboard and Europe was less expensive and more practical than the one through York Factory. Consequently, Upper Fort Garry gradually became the main HBC collection and distribution center. In 1857, the Royal Canadian Rifles, a regiment of the British army, came to stay in Upper Fort Garry. Upon the troops’ arrival, many storehouses had to be converted into living quarters for the soldiers. Temporary structures, including cookhouses, sheds, kitchens and latrines were also built. The soldiers’ presence, and the expansion of Hudson’s Bay Company business at the Forks, meant that more storage space was badly needed. 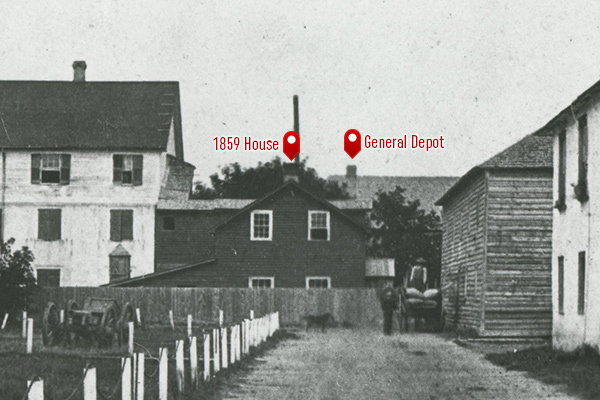 For these reasons, in 1860, two storehouses, one of which would become the General Depot, were built in the northeast corner of the Fort. The General Depot was similar to storehouses previously built at the Fort except that it had fewer windows and no roof gables. It also had chimneys on both ends. 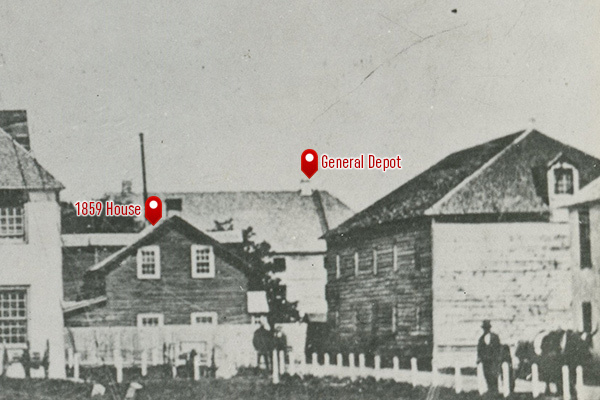 The Depot was the last building in the post and beam style to be constructed at Upper Fort Garry. The General Depot was built in the section of the Fort designated as the ‘residential compound’. This area contained dwelling houses and a garden and was supposed to be separated from the fur trade and military business in the Fort’s southern half. However, in the late 1850s, there was no room to build elsewhere and a new storehouse was desperately needed. The Fort’s planners compromised by building a loading gate into the east wall across from the depot. This way, goods could come in and out without disturbing residents. One of two storehouses built in 1860.